Converting a banking new account application and subsequent onboarding process for an increasingly digital world is an involved process. To be successful, financial institutions need to build a digital sales strategy, analyzing each step to determine levels of abandonment. The impact of this effort will include increased sales and an improved customer experience. In the last six months, 67% of online retail shoppers have made purchases that involved multiple channels, easily moving from the web, to the tablet, to a store for a consistent and convenient experience. While signing up for a credit card or completing an application for a home loan is not the same as shopping on BestBuy.com, consumers now expect financial institutions to deliver similar digital channel experiences for their banking products and services. According to a report by Aite Group, Multichannel Client Onboarding: Anytime, Anywhere, Any… How? new consumer preferences and ongoing regulatory changes mean that integrated multichannel new account opening and onboarding processes are needed. It was also determined that organizations that fail to incorporate mobile and Web technologies into their client-facing processes will be left behind. In short, financial institutions have a customer experience dilemma. In order to fill the growing customer experience gap, banks and credit unions need to digitize, and drastically improve, digital account opening processes to create enhanced consumer experiences or risk a drop-off in the digital sales process down the line. 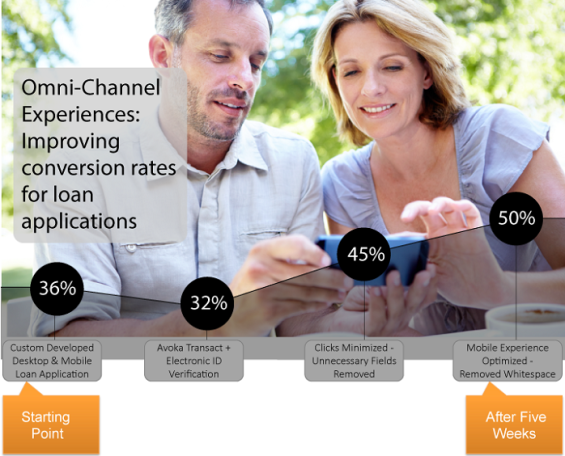 In the Avoka white paper, Mobile Engagement & Data Collection: 16 Best practices When Building Your Strategy, it was found that focusing on improving digital data collection and new account onboarding processes can result in more deposit accounts opened, more credit cards issued, more loans sold and more satisfied members and customers. In addition, knowing where consumers may have abandoned an account opening process, combined with the agility to rapidly fix problems contributing to abandonment, will drive incremental business. In a case study provided to The Financial Brand by Avoka, a lender wanted to improve their personal loan application experience for loans averaging $15,000 across digital channels (desktop, tablet and mobile). They didn’t want to touch the loan approval process, but rather, focus on making incremental changes to the digital application and onboarding experience. The company already had a desktop optimized and mobile optimized application form – and was processing 1,000 applications per week of which 35.7% were submitted to completion (or converted). This equated to $1.7MM per week. However, the lender saw the 64.3% abandonment rates on loan applications as a significant opportunity for improvement. Unfortunately, the lender didn’t have the analytics built into their online application process to know where the consumer was abandoning the process or why. And even if they did, the customer-coded nature of their loan application experience meant that making changes would be slow and expensive. So, if they had a hypothesis that “changing X” would improve conversions – testing that hypothesis would be expensive, slow, disruptive and risky. They decided instead to invest in a new digital sales tool for transaction-based customer engagement … and the results were staggering. The lender chose to re-build their loan account opening application experience with a digital engagement platform that could provide them with the analytics to “know” what was going on during the loan application process. The platform also provided the agility to rapidly, safely and cheaply make changes to the experience to test “hypotheses”. The lender also decided to make changes to the application and onboarding process one-at-a-time, to ensure they could see the impact of each individual change. Controlling variables as opposed to bundling multiple changes in a “release” allowed them to know if an individual change had a positive or negative impact on conversions. Introducing electronic ID verification resulted in a lower conversion rate as it was more difficult for the customer to complete the application – but the “completeness” of the application was higher due to better quality data. The introduction of abandonment management assisted with conversions and reduced the initial negative impact – but it was still negative. Overall conversions dropped to 32%. The account opening application experience was viewed as a “funnel” over a 5 day period, with each section of the application process (loan type, consumer details, identity insight, employment history, etc.) being viewed as a section of the funnel. Completion rates based on analytics for each section were then calculated. This process highlighted that there were issues in the identity section of the application process. Further investigation highlighted specific data fields such as the date field, the type-ahead address, and unnecessary fields such as previous address that added on to the application time without adding significant value. These seemingly trivial changes were made and deployed into production in just 2 days, and resulted in an immediate increase in conversion rates to 45.4%, a 27% improvement from the starting point of 36%! This moved conversion rates in the right direction, but more could be done. The application experience continued to be analyzed as a funnel for the next 5 days. The employment section of the form was identified as another opportunity for improvement, since abandonment in this area was high. Similar to the ‘previous address’ changes, it was identified that asking for the name of a previous employer and dates of employment negatively impacted completion rates. Upon review, it was determined that the only information ‘required’ was the current employer name and “length of time” at that employer. Upon further analysis, it was identified that 51% of applications were coming from smartphones. As a result, the same sales funnel analysis was applied for the smartphone applications to see if there were differences in completion with mobile devices. These changes, with some other tactical improvements, were made over a period of just 3 days … one at a time … to see the incremental impact. The result was a new average conversion rate of 50% – a 39% increase over the initial 36% conversion rate. The lesson learned here is simple but powerful. Small, incremental changes to a digital application and onboarding process can have a significant impact on all lines of business and are relatively easy to implement. Rather than being complacent, and potentially lose a significant portion of qualified business leads, a focus on the digital sales process can achieve dramatic results. Over a 5 week period, loan conversions in the case study improved from 36% to 50% – a 39% improvement. The net impact on the loan book was an increase in weekly loans approved from $1.74MM to $2.65MM. Financial organizations have invested in digital marketing to personalize content and create engaging experiences for customers, but many organizations still too easily accept high industry abandonment rates on new client applications rather than guiding qualified leads through the digital sales funnel. If your consumer experience doesn’t integrate mobile, based on this example, you might have lost a significant percentage of prospective customers who wanted to apply via their smartphone or through another digital channel. Avoka found that there are 16 common areas to consider when developing mobile engagement and data collection solutions. Each of these is expanded on in the white paper, Mobile Engagement & Data Collection: 16 Best practices When Building Your Strategy, with key takeaways to keep top of mind when planning your mobile data collection strategy. A focus on digital sales and a movement to create an integrated channel experience is the necessary next step to dramatically increasing new client acquisition and application conversion rates … turning more browsers into buyers. While transferring paper-based or static-based PDFs online has become a necessity in a mobile all-digital world, building a mobile engagement and data collection strategy can seem incredibly complex or too expensive to accomplish any time soon. A digital strategy can be achieved, however, with minimal pain if you set priorities and adopt a phased approach.